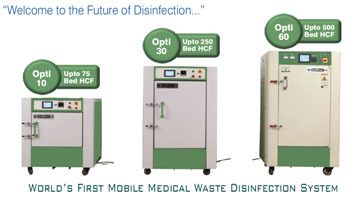 ISHWM is knowledge partner for Mobile Microwave Medical Waste Disinfection System. In this series OptiMaserTM: is World’s Pioneer Mobile Microwave Medical Waste Disinfection System. Indian Society of Hospital waste Management recommends the microwave technology OptiMaser for pre-treatment of biomedical waste.